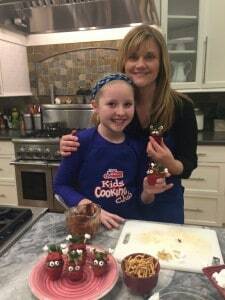 We stayed focused on the classroom party at the Price Chopper Kids Cooking Club with our second recipe share this month & Bella joined me to take stuffed strawberries to a whole new level. With the right filling, some Chinese Noodles, mini marshmallows & a few other delicious additions, we turned them into adorable Valentine’s critters to share as this year’s sweet treat. You can watch Bella serving this recipe below & then grab all of the ingredients to share with your friends. Wash the strawberries. Let them fully dry. Cut off the top of the strawberry. Hollow the inside of the larger part of the strawberry by using a small paring knife or serrated spoon. Cut the tip of the strawberry off so that the strawberries will stand. Using a rolling pin, roll the mini marshmallows flat. Cut out a mini heart by using clean kitchen shears or a mini fondant cutter that’s heart shaped. Insert the marshmallow heart into one end of the Chinese noodle. Insert the other end into the top of the strawberry you have set aside. Repeat to add two antennas per stuffed strawberry. Melt the chocolate morsels in a microwave in a glass bowl on high for one minute. Stir the chocolates once you remove them from the microwave to complete the melting process. Let them cool just long enough that it’s not steaming hot, but not cool enough to begin to set. Fold the melted chocolate into the whipped topping. Using a piping utensil, fill the strawberry & continue generously over the top so that you can add two candy eyes and complete the stuffed strawberries with the top that holds the antennas. Candy eyes: These can be found at your local craft store. Chinese noodle note: Depending on the length of the Chinese noodles, you may want to break them in half to create the antennas. These little sweet treats are adorable! And, thank you for hosting. Have a great week…. THANK YOU-AND than you for the invite…and for hosting! Hope you had a great Vday! Super cool! Thanks so much for sharing your recipe with us at Funtastic Friday. I love chocolate strawberries. These strawberries look divine! THANK YOU – they have been a hit wherever we’ve made & shared this season. We’ve been having fun with these little Valentine Critters! And, it’s a delicious make even when it’s not Valentine’s day…. We’ll have to wait to make these when strawberries are a better price – they are really expensive here. Thanks for sharing on the Creative K Kids Linky Party this week. I hope you will join us again next week.